"Who Would Sell Their Property For $200?!?!??" On Day 1, we discussed why tax lien sales and tax deed sales are imperfect ways to get tax properties, though occasional bargains do happen. On Day 2, we talked about contacting the owners of property in tax sale, so we could get ownership now and avoid bidding if the owner wanted or needed to get rid of the property. But we got a little ahead of ourselves. How do we find out who is about to lose their property? And what do we say to them? Why on earth would they sell their property for $200 or less? No matter how your state's delinquent tax system is set up, all states have one thing in common: If an owner doesn't pay taxes long enough, they will lose their property eventually. Maybe there will be a tax deed auction after taxes aren't paid for 2 years. Maybe after 1 year of delinquency, the state will sell a lien against the property and the owner will have 1 additional year to pay off the investor before losing the property. Notice that, regardless of the system, there will be a "drop dead date" by which the owner must pay the taxes to avoid loss of their property. You just have to figure out what that date is. Find the "Drop Dead Date"
In the case of a tax deed state, the tax deed sale date is usually the "drop dead date". Some states have a "redeemable deed" sale, where the owner gets an extra time period to redeem after the sale occurs. No problem, just add that period to the date of the sale, and you have your "drop dead date". In redeemable deed states, it doesn't hurt to contact the owner prior to the sale either. If your state sells tax liens against property, there will be a certain time period during which the owner can redeem after the lien is sold. If that time period is two years, add two years from the date of the lien sale and you'll have your drop dead date. In my state, each county has a yearly tax sale, and sells a lien against delinquent property. That lien must be paid within 1 year or the owner loses the property to the investor. So, I just go to the courthouse and look at the last sale that was already conducted. I know the owner must pay within 1 year, so I add 1 year from the date of the lien sale and I know when their "drop dead date" is. I access the results of the sale to see which properties had liens sold against them. Then I see who has paid those liens off in the meantime, and cross them off the list. This leaves me with a concentrated list of owners who still have a lien against their property. They're still facing a deadline to pay, coming soon, and they will lose their property if they don't follow through. It's always exciting when you get your list and narrow it down to the owners who are still in trouble with their taxes. There are almost always owners who have walked away from their property and are just waiting for your letter or call, and want to practically give their property away! Now it's time to contact the owners about to lose their property. This owner can and will pay his taxes. Or maybe he already has paid since you last updated your records. He will tell you that he paid, or is planning to pay. For some reason, he is just taking a silly risk by allowing his property to get this far into the process. I usually check up as the deadline approaches to see if he really does pay. This is a somewhat common situation. The owner most likely lives in the house, and doesn't want to lose their home. Many of these owners are looking for a loan, which I do not recommend you do under any circumstances. You may want to buy the home and give the owner a chance to buy back or rent. Many state laws are getting tighter about "rescuing" homeowners from losing their home and allowing them to stay. For this reason I am very careful when I allow a homeowner to stay in the house when I buy it. You'll also find many absentee owners who just want to sell the property. The prospect of losing all equity in the house will inspire a lot of owners to "cut and run" by selling cheaply to you. These are the owners we really love! You will constantly be surprised at properties that owners will walk away from. Many are inherited properties with out of state heirs. In other cases the owner has accepted the fact that he will lose the property and has stopped thinking about it. Owners in this situation will tell you straight up that they don't want to pay the taxes and are just letting the property go. We will often get deeds to these properties for $100 or less. Why Would They Take So Little? The important thing to understand is these owners don't take $100 "for their property". They've already let the property go in their own mind, and are taking $100 as a token payment for their time in signing it over to you so you can see if you can do anything with it (sometimes you can't do anything with it!!). They just don't care about the property. 1. They bought land to build a future house many years ago. They've been paying taxes on it for years or decades with no return. Their plans have changed, or their financial situation has taken a turn for the worse. They just want to quit having to pay the taxes and they have done so. They're ready to put the experience behind them and will sign it over for enough money to have a decent meal out. 2. They grew up poor, moved away, and bettered their situation. Now they ended up with Mom's house after she passed away, which needs tons of repairs and is only worth $20,000. They don't have the time or inclination to deal with it from hundreds of miles away. They think they'll have to spend money on repairs and deal with contractors. The tax bill is $4,000. They're just letting it go. 3. They're irresponsible, and never did anything with the property they inherited from Mom. After living in it for a while, the repairs and tax bills started mounting, and they moved out. They don't have any way to redeem it and could use a few hundred bucks. I could probably write 10 more scenarios like this, but I hope you understand how a small percentage of people get into these situations and the end result is the upcoming tax sale of their house. And, why they have not done anything about it. Next time we'll talk about how we contact the owner, and how we negotiate based on which group the owner falls in. "What Do I Say to the Owners?" Mark, that is actually a great question. Nothing more is needed except for my ebook. However, some people want to take their business to the next level, and for that I also offer various tools and done-for-you materials that I sell also. These are optional and not needed to be able to start doing deals. I have been looking at this other program I'm sure you know who I'm talking about when I ask this question. Can you go and get these surplus funds with one document completely in your name . Yes, we found (unexpectedly) that most of our deals actually involve an inheritance somewhere. Most of the time though, the probate has already been done, or can be done in just a couple weeks because the property is the only asset. 4-6 weeks ahead is plenty of lead time to get deals done. However you should consider requesting the entire tax-delinquent roll (New Mexico may call it a slightly different term) on CD from the county. Then you can see which properties are just now becoming delinquent, and which ones are nearing deed sale - it's almost like an "advance tax deed sale list". Thank you for the quick reply and being a real person, not just another unreachable net guru. Looking forward to working with you and being NM's top deedgrabber 🙂 And I will get the state manual too. Thanks again. does this manual cover any state in the uinited states of america. and how much is the cost. It's intended to broadly cover the United States and show you how to research your desired area yourself. OR if you wish we offer State Manuals as well. The ebook is $59 (occasionally on special for $47) and found in the Products Section. Hi Rick, all your material sounds really good! Funny how I have never heard of anyone touting this angle before; coincidentally, my short sale realtor mentioned last night how he bought a property at the tax deed sale but he may have to wait about six months for quiet title. I got a call from one of your people yesterday and I am excited to get started and supplement my other marketing. I just wish there was a cheaper way to skip trace because I can use it for all my marketing - probate, absentee owner and Deed Grabbin'! Thanks for all your help now and in the future! I can't wait to give you a testimonial! Google for "skiptracing batch upload". There are companies that will accept a list of people and update them for you for a nominal fee. However it's not nearly as effective as doing a "deep search" of course. I live in Mexico about 250 miles below the border. 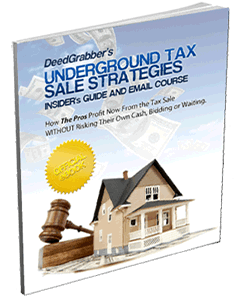 I have studied Tax Deed and Tax Sales courses and understand the concept. I was told this could be done anywhere in the world if you had a computer and access to the internet. I have been also been told with proper due diligence and for the right price you could be sucessful without physically inspecting the property. I was also told by an attorney in Texas that sells his own course that I should never buy a property without first physically inspecting the property. Now you come along and say I should not buy at auction but basically be a deed grabber. What you say makes since to me but you know a lot more about this business than I do so what advise do you have for a retired person who does have time on my hands and would like to make a living buying Tax Deeds? I am not interested in Tax leins because I am interested in turning property quickly for a profit. Do you think with my sircumstances that your course would make since in persuing and does your basic e-book really give me the tools to proceed with due diligene on my own along with the assistance of the internet? Tax deeds are not necessarily "quicker" or "more profitable" because of the bidding that occurs at the sale. That's why I use either as a signal to contact the owner, get an instant deal, and avoid bidding/waiting. If you get cash buyers in the area you want to work, you can let them inspect the properties. Their opinion is the only one that counts anyway, they're buying! What happens when name on the deed has been deceased for two years. No other names are on the deed? Is wife entitled or kids if there is no will? Depends on the state but generally, spouse and kids are entitled, 1/2 to wife, 1/2 distributed among kids. But it IS state specific and not always exactly so. Spouse may get first $XXXX then kids split rest, spouse may get all. Look up "intestate succession" for the state and you can find out. You stated above that some people are taking $100 as a token payment for their time in signing it over to you so you can see if you can do anything with it (sometimes you can’t do anything with it!!). When and why would we not be able to do anything with a property that is now ours? If the amount of taxes is more than the property is worth, or if the property turns out to be worthless. out but is the same true if you deed grab and pay the owner for his house and then pay his taxes? Are the mortgages ALWAYS wiped out before the tax Lien sale? You need to ask them about this and then ultimately get a title report to be sure. It's all in the material. If the homeowner has a mortgage, and the homeowner or the mortgage company has not paid the taxes in 4 years, if i buy that tax lien wouldnt I still have to foreclose on that property? Usually there is an action needed to gain ownership of the house once the redemption period is over. Depending on th state you might have a year to several years to wait before you could start the foreclosure. The tax foreclosure is almost always much simpler than a mortgage foreclosure. In some states they can pay you off right until you get the deed from foreclosure, other states they cannot pay you off once the redemption period is over (like Indiana). So the procedure is the same whether or not there is a mortgage, you would have to foreclose (tax foreclose) any property you got from tax sale. Make sure you get an attorney to help you with noticing if you buy liens. I appreciate the straight forward answers to questions in the comments section. There are some other sites that go completely around the question. Thank you. Can mobile homes be brought for back taxes? Yes they can, often they are in special sales that the county holds of just mobile homes. 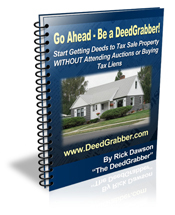 "Rick’s 'Deed Grabber' ebook is comprehensive. But the best part is he anticipates where you’ll get stuck, and he walks you through everything as if he’s right there at your side. Truth is, he is always available to help in person or on the line." "I have recently bought your book and on reading it I found that the book was well written and and the instructions were easy to follow. I am at the point where I am contacting the tax collectors of the municipalities for 2007 and 2008 tax liens sold and not redeemed. I am very confident that I will make a success of DeedGrabbing." "Although I have not been fortunate enough to grab that deed yet, the book was excellent. Very informative, easy to read and understand and best of all, has motivated me at age 74 to get up and realize these types of deals are for everyone who gets the knowledge and believes that dreams can come true. I’m working on my first deal and will let you know all the details." Enjoyed the last version of the book. It gave me some real insight on this business and made me feel good about making money this way rather than buying tax deeds at the auction or waiting for the redemption period to end. I am very encouraged and I'm looking forward to sharing the details of my first aquisition with you in the near future.